The full size Jet Set & Protect Leave On Mask is one of the best products I have ever had the pleasure to use. This in-flight or overnight mask combats common skin concerns like dryness, irritation, dullness, pollution and free radicals. A combination of carefully selected ingredients, such as Marine Hyaluronic Acid, Coconut Oil, Watermelon and Apple Extracts help create a barrier on the skin against harsh air. Helps with long-term moisture retention. Protects skin from recycled air. Soothes distressed skin. The deluxe size of Snow Mushroom Water Serum is a superfood-powered serum that delivers hydration and minimizes the appearance of pores and fine lines. It can hold nearly 500 times its own weight in water, creating an intense surge of hydration also locking it in long-term to improve moisture retention. This serum hydrates, and improves moisture retention, it minimizes the appearance of pores, reduces redness and it contains collagen-boosting properties. The deluxe size of the Turmeric Brightening Polish is a multipurpose polish for face and body that instantly makes skin brighter and softer. Powered by turmeric, the ancient spice known for its healing anti-inflammatory and anti-oxidant benefits. This expert formulation leverages the Turmeric root to prevent staining. It also includes Sandalwood for toning and Olive Oil for serious hydration. This polish exfoliates, brightens, tones, hydrates, and promotes overall skin radiance. The deluxe Oceanene Youth-Boost Gel is a lightweight yet powerful active gel moisturizer that combines Marine Algae with anti-aging bio-actives for hydrated and younger looking skin. Their trilogy of anti-aging heroes: Brown Algae, Sodium Hyaluronate and Vitamin C leave skin hydrated, smoother and improved. This product helps to hydrate the skin, instantly plumps it, brightens, evens out skin tone, and helps reduce the appearance of fine lines and wrinkles. Used together these products will leave skin feeling and looking like its most beautiful self in no time. My favorite product is the Jet Set & Protect Leave-On Mask. This can be worn under makeup (but with sunscreen) or at night to rehydrate the skin. Or wear it on the airplane to help hydrate the skin and leave dehydrated skin behind. However, the Turmeric Brightening Polish is just as nice too, as it prepares skin to accept the benefits of all the other products. The Volition Beauty Winter Survival Kit does wonders for the skin that will allow you to try four of its best selling products that do what no other products do. 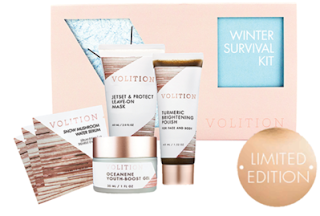 The Volition Beauty Winter Survival Kit is $34.00 and can be purchased online at www.volitionbeauty.com. This set makes an awesome gift set for anyone on your list. Men or women will love it. I think this is something that you get for anyone who loves skincare. Like Volition Beauty on Facebook: https://www.facebook.com/volitionbeauty; Follow Volition Beauty on Twitter: @volitionbeauty; Follow Volition Beauty on Pinterest: https://www.pinterest.com/volitionbeauty/ and Follow Volition Beauty on Instagram: https://www.instagram.com/volitionbeauty/.